Flexofold sailboat propellers are known as some of the very best propellers in the world and we welcome the many positive comments from customers who call, write or visit us at boat shows. Below, you can read a few statements from our happy customers. We put the boat back in the water with the new Flexofold prop and sailed home about 50 miles. I could not believe the improved performance. We had the original two blade fixed propeller that came with the saildrive and we could do about 5.5 knots and really had to push the engine if we wanted to do more. With the Flexofold three blade, we easily had a 20% increase in speed at 500 rpm less on the engine and the engine was running 8-10 degrees cooler. Even my wife said she felt the difference and said it was the best money we have spent on the boat since we have owned it! The only negative so far is a little vibration at idle speed, but it goes away as soon as we go a little faster than idle. We are very pleased. In forward I gained almost half a knot at my normal Cruising RPM. In fact I now motor at lower RPM. In reverse the performance is excellent & with less prop walk than with my old fixed prop. The reverse action is smoother and there is no significant drop in power the only difference i noticed is that the initial burst of reverse power I need a little more rpm but once the boat gets under way there is no difference. I tried a crash stop in flat water from 6kts and the boat came to a dead stop in about 1 boat length. (35ft). The boat's displacement is approx 5000KG. With respect to sailing the improvement is clearly there, no more noise from the prop and a marked improvement in sailing performance especially in light to medium airs. You have one very happy customer and that refers to both the product as well as the service". After a 400 nautical mile voyage from Tortola to Grenada, I am happy to report that my new Flexofold props are the single best upgrade I've ever made to my catamaran. I wish I'd replaced the old props years ago. My cruising speed under power is at leat 1.5 knots better than before at the same RPMs and under sail, I've picked up about 1 knot better performance. They are simply the best! Thank you again for all your assitance in determining the sizes for the 2 different saildrives. We love your props! I wanted to give you some feedback after several days of using the new prop: At this point I feel it is perhaps the best piece of equipment we have added to the boat! Speed under power is 0.6 to 0.7 kts faster at the same engine rpm and although our good sailing days at this point have been limited. I think the improvement is going to be at least as much as what we are seeing under power. My new propeller has just arrived at my home address in Sydney Australia just 5 days after you shipped it. Amazing service - thank you! I showed it to my boat crew this afternoon and they were most impressed as I was with the quality and finish of the propeller. I just wanted to send you a note on how delighted I am with your folding prop! It is much better matched with my boat than the factory installed prop – no cavitation issues and speed under power better matched with engine rpms. I have especially noticed an improvement in speed under sail. I am very pleased with your product. After again an excellent advice the change follows: WHAT A DIFFERENCE: unbelievable how good it is and why sailors could use anything else than a Flexofold. Great move forward. Super move backward and noiseless, easy folding. Adding the 3 bladed Flexofold was the best thing ever. Should have done it years ago. Better performance under sail and power. Cut fuel consumption in half! Just a brief note to let you know how pleased I am with both your service and the prop performance. Seven days from order to receipt included 2 days delivery within Australia. You supplied the 3-blade 22" propeller at short notice and it was duly fitted. I hoped for a performance improvement over the 20x14” 4 blade Tri Stream unit fitted as standard by the boat builder. Cruising revs (100 HP Yanmar) dropped from 2950 to 2400. GPS boat speed increased from 7.1 to 8.2 Kts. Fuel consumption (motor sailing) over 900 Nm compared to 6 previous trips on the same route dropped from .81 to .78 litres per Nm. Acceleration ahead and astern is improved markedly. The astern performance has improved dramatically. Prop walk astern is almost absent. Obviously engine noise in the salon is greatly reduced. Congratulations on a world class product. I received my prop and installed it on March 23, that day I only motored a bit to see how it worked. Forward I now reach 7.5 knots at a comfortable RPM and before 6.5 was over reved. Reverse thrust is predictable and strong. This past Saturday I sailed along with a boat that is one of the fastest in our racing fleet and he did not pass me in an hour of shadowing each other. At Dauphin Island Race Mobile Bay AL we placed second in class in the warm-up race4-23 and first in the DIR race 4-30-2011. I feel the Flexofold prop played a part in this success. This is the end of my second season on my 2009 Beneteau 49. My Flexofold performed flawlessly. I had zero drag issues and my prop always folded closed while sailing. I keep my boat in Annapolis, Maryland and frequent a restaurant called Pussers. I have to parallel park my boat into whatever space they provide me with, usually not more than 53 feet. While I have a bow thruster, my Flexofold prop stops me on a dime! The Chesapeake does have a fair amount of crustacean buildup but it has never jammed up or affected my props performance. I have been sailing for over 40 years and was very sceptical of switching over from a fixed blade prop. This prop has completely changed my mindset. Danish Champion in 2008 and 2010. When we started Team "Sort Sol" we were very conscious that a propeller is not just a propeller. It was important for us that we found a partner who could understand our needs and high demands in terms of performance and low drag. We expected that we had to use one propeller for racing and another for cruising. Flexofold, however, got the solution and supplied a fantastic 2-blade Flexofold Racing propeller which meets all our requirements! It has a very low drag under sail and high performance under power, without any vibration. So, with Flexofold we can use the same propeller for both racing and cruising. Much obliged! At the beginning of the year I have purchased a flexofold 3-blade propeller for my sailing boat. In the meantime, I have transferred my boat from the Baltic to the Mediterranean and sailed from beginning of Mai until now about 3500 miles. After this long trip, I wish to congratulate you to the performance of your propeller which proved to perform extraordinary well. I reach the required speed at all sea states and winds at less revs which saved a lot of fuel. Compared with other propellers I used during the last 13 years, your propeller proved to be the best. As per your advise I switched from a Flexofold Race-propeller to a standard Flexofold propeller on my my IMX-40. as the race version :-) It was perfect customer service! Group winner of the 138 nautic miles regatta "Palby Cup 2010", Denmark! "When installing a new electric engine I should have a relatively large 16" propeller - which worried me a lot. I ended up choosing a Flexofold Racing Propeller which is perfect in terms of low drag, high preformance and super finish. I´m very pleased". “We have a Dynamique 52 that weighs 17 tons. After 4 years with a fixed propeller we changed to a Flexofold 3-blade 22x15-3R propeller in May 2004. We were a little worried about how it would perform by dock maneuvers, especially in reverse. But it is not a problem, it works 100% ok. By cruising, the engine fell 2-300 RPM for the same speed. By sail we enjoy the extra 1 knot speed and no tingling from the shaft. The propeller is still, after 5 years in the water throughout the year, still as new, no corrosion or traces of wear”. “On May 7, 2010 I installed my new 3-blade Flexofold propeller and yesterday tried out. The calculation and recommendation was very good. Already by 1450 RPM I have a good "cruising speed" of 6.3 knots. At 2000 PRM it´s about 8 knots. Regarding propwalk in reverse, you were right, this is much less than with my old double-wing fixed propeller. I am very pleased with the smoothness: No cavitation or noise, no vibration, no shock when the propeller opens. Praise the manufacturer! Thanks for the good advice". 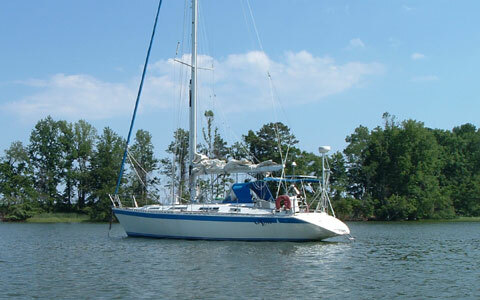 “When we bought our LM 30 she had a fixed propeller with a lot of drag by sail. We have had even a very good experience with Flexofold on our previous boat - it works. So we had no doubt that our LM30 should have a 3-blade Flexofold propeller too. This time we agreed with Flexofold that we should try not to install the zinc anode on the propeller. Result: we had only 6 barnacles on the propeller, whereas propellers on boats around us were totally fouled. The propeller is not polished nor treated with any kind of anti-fouling. We have now sailed in three seasons without corrosion and fouling - simply fantastic!". "For 5 years, I am thrilled from your 2-blade folding propeller on my Compromis 999. Last week I called you as the shock absorbers were broken (replaced free of charge). The sent shock absorbers are now mounted and next week we go back into the water. Now I am not just very satisfied with the propeller, but impressed by your customer service. For me, the choice of a new propeller (I am looking for a new ship at the time) is already determined. It will be a Flexofold!"